In the recipe I recently posted for oatmeal scones, I included whey as an ingredient. Whey is not something most people have hanging around, so where did mine come from and why was I using it? The short answer is that I’ve been making my own Greek yogurt, and as a result of the straining process I end up with a lot of waste whey. But that whey is not really waste; its flavor and acidity give it many uses in the kitchen, and it still contains some nutrition to boot. I’ll get back to whey later – for now let’s get to the yogurt. I eat a lot of Greek yogurt. I start most days with fresh fruit, granola, and yogurt, and I may go through about two pounds of the stuff in a week. At about $4/lb it’s not exactly breaking my food budget, but by putting in about 15 minutes of work I can save $3 on every pound I make. That works out to over $300 a year given my rate of consumption. Not bad. Plus, it’s a pretty interesting kitchen project and puts me in control of my food. Due to my limited tools here in Britain, how much control I can exercise is also limited. I haven’t been able to effectively experiment with times and temperatures to see effects on texture and flavor. The upside is that the only really necessary equipment is a pot, a colander, and an old (clean, preferably undyed) t-shirt, which most people have around the home. Commercially available yogurt makers or other equipment may provide some added measure of convenience and control, but just like other fermented foods, yogurt is very forgiving and quite happy to adapt to whatever environment you provide. This is the foam you’re looking for. Heat milk to about 180 degrees F in a pot, stirring often to prevent scorching. This step causes milk proteins to unfold and aggregate, which will provide structure to the finished yogurt giving it a smoother texture. If you don’t have a thermometer (I currently don’t), you can tell that the proteins have started to aggregate because they will stabilize foam on the milk’s surface as you stir. This phenomenon is similar to the network of aggregated proteins in gluten trapping carbon dioxide from yeast in bread dough. Let the milk cool to about 95–100 degrees F. If you can hold your hand to the side of the pot for 10 seconds without discomfort or pain then you’re in the right range (provided it still feels hot or warm). Add two tablespoons yogurt per quart milk to a small bowl, and pour a little of your hot milk into the bowl. Stir the yogurt into this small amount of milk until it is all dispersed, and then stir this small bowl of milk back into the large pot. It is important that the yogurt contains live cultures. Commercial brands will carry a label if they do (I used Fage to get my yogurt started), and obviously it is also okay to use a previous batch of yogurt to start a new one. Incubate the milk for 4 to 12 hours as best you can. Longer incubation times allow for more lactic acid production by the cultures, which results in more tang. The lactic acid also drops the pH, denaturing more proteins which aggregate to make the yogurt thicker. Temperature also plays a role, but I haven’t read consistent reports on its effects and have not done my own experiments yet. After incubation, you have yogurt that is ready to eat. However, if you want Greek yogurt, you’ll have to add one more step: straining. Line a colander with a tight-knit cloth and set it into a bowl or pot so it is elevated from the bottom. 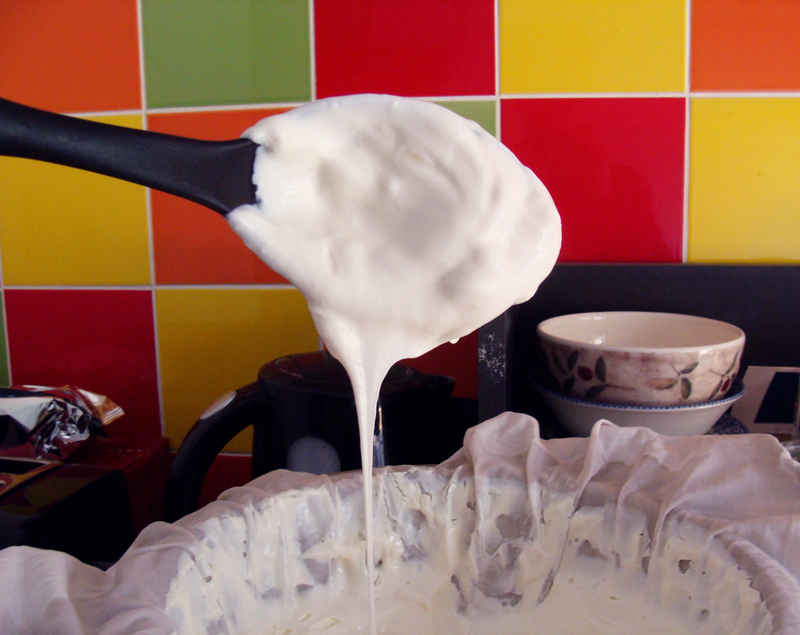 Pour your yogurt into the colander and let it rest until the yogurt reaches a consistency you like. The speed of straining is determined by the tightness of the weave of your cloth and whether you periodically scrape firmer yogurt away from the sides. It is important that the weave is not so loose that it lets yogurt drip through. If you strain your yogurt, you’ll find that four quarts of milk generally yields around 1.5–2 pints of Greek yogurt (obviously this depends on how long you strain it). That’s it! The process is very adaptable to your situation. You can use almost any type of milk as long as it is free of preservatives, though there is some debate about the effect that pasteurization has on the end product. I haven’t experimented with raw milk myself, but am happy with my yogurt. Certainly fat content makes a difference, with increased fat levels increasing both end yield and enriching the end texture and flavor. I incubate my yogurt in the oven with the light on, sometimes turning the oven on to its lowest setting for 5 to 10 minutes to keep the space warm. I usually begin making yogurt at dinner time and then begin straining in the morning. The total active time is 15 to 20 minutes mostly spent heating the milk, packaging the finished yogurt, and cleaning up. Other ideas for incubating include transferring the milk to a bowl that will fit in the microwave, wrapping it in towels, and then placing it in the microwave (which is quite well insulated). Some people use a heating pad or hot water bath in their sink. You can use these techniques in a picnic cooler for added insulation. Whatever your solution, just try not to physically disturb the incubating yogurt, as jostling can upset its developing texture. For the cloth, I just use an old cut-up t-shirt. Some people use cheesecloth, but I’ve read of some people being unhappy with that material. Lint-free towels (certainly not terrycloth) are also an option. You can also ditch the colander and tie up the cloth around the yogurt, hanging it over a container to catch the whey. While some people recommend refrigeration before or during straining, I strain immediately after incubation. In fact incubation will continue for a few more hours this way. There is no health risk in leaving the yogurt at room temperature for another 12 hours, though I typically keep the yogurt covered during both incubation (to help with insulation) and during straining (just so nothing falls into my food). As a word of warning, my yogurt isn’t exactly like what I would buy at the store. My yogurt has been both significantly less and more tangy (depending on the batch), and has a very slight cheesy flavor. The flavor took a little getting used to, but after eating it for a couple days I found myself liking it just as much and in some cases much more than store-bought yogurt. The yogurt strongly adheres to itself. Also note how far the level of the yogurt has dropped during straining. The texture of my yogurt is also different from the commercial versions. While I can strain my yogurt to the same thickness, the texture differs in a way that’s hard to describe. It’s not exactly more viscous, but seems more viscoelastic (I confirmed that yogurt is what’s known as a pseudoplastic). If you’re not familiar with non-Newtonian fluids, this might not mean much, but basically I’d call it a little gloopy. After straining to the thickness of Greek yogurt, it may feel stiffer than you’re used to. While it may seem strange and unfamiliar, it doesn’t affect the mouthfeel and it’s still pleasant to eat. I’ve also noticed that while Fage or Chobani will release whey during storage, my homemade yogurt does not. Speaking of whey, since the volume lost from a half gallon of milk to just a quart of Greek yogurt is all due to the drained whey, you’re going to end up with a lot of whey. Whey has about the same amount of carbohydrates (mostly lactose sugar) as milk, but none of the fat and only a quarter of the protein. Its acidity makes it a good low-fat substitute for buttermilk and possibly a pleasant counterpoint in sweet fruit smoothies. It is also a good replacement for water in recipes where added nutrition or a tangy flavor is desirable, and I’ve been using it in my breads and pizzas for that benefit. As an added bonus, the lactose in whey helps pizza crust brown but has very low sweetness and so will not affect the final flavor like table sugar (sucrose) would. It is important to remember, however, that acids can degrade gluten and therefore using whey, especially combined with sourdough starter, can be a balancing act. I have made several doughs that would not hold structure and suspect it was due to excess acid introduced by too much whey. I’ve found whey also makes an incredible storage medium for fresh mozzarella. Typically I’ve stored leftover mozzarella in a zip-lock bag with water for up to a week in the fridge. Past a week I have often observed mold growing on the cheese. Meanwhile under acidic whey, which is extra hostile to many spoilage organisms, I’ve stored mozzarella for up to two weeks in the fridge without any problems. I just rinse off any whey clinging to the cheese before using it. Whey can also be used to revitalize refrigerated mozzarella for caprese or dishes. Supposedly whey can also be made into ricotta, but I suspect this may only apply to sweet whey (a byproduct of cheeses that are made with rennet) or at the very least involve incredibly low yield and therefore require very large volumes of whey (i.e. gallons) for a modest amount of cheese. After all, almost all of the fat and about three quarters of the protein is lost going from milk to whey. However, whey can easily be turned into other foodstuffs. Other than the suggestions above, it can make a flavorful addition to almost anything that uses water (e.g. broths and sauces) and is especially appropriate for recipes calling for vinegar or other acids (e.g. marinades). It can also be used to jumpstart fermented vegetables, or even a sourdough starter, both of which would benefit from an acidic environment welcoming for lactic acid bacteria. This entry was posted in learning, recipes and tagged fermentation, fermented food, Greek yogurt, lactobacillus, physics, whey, yogurt on April 5, 2014 by Dylan Bargteil. 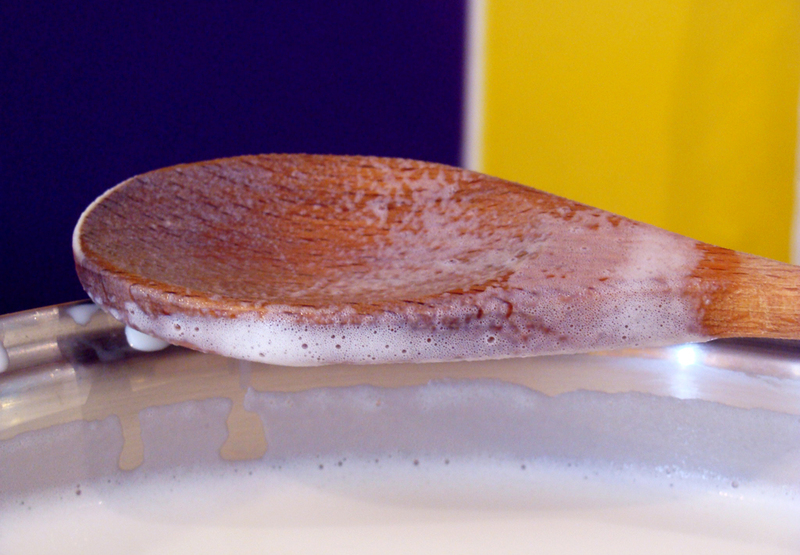 “This is the foam you’re looking for” — ha! My mother has a yogurt maker. The results are far more delicious than anything from the supermarket. 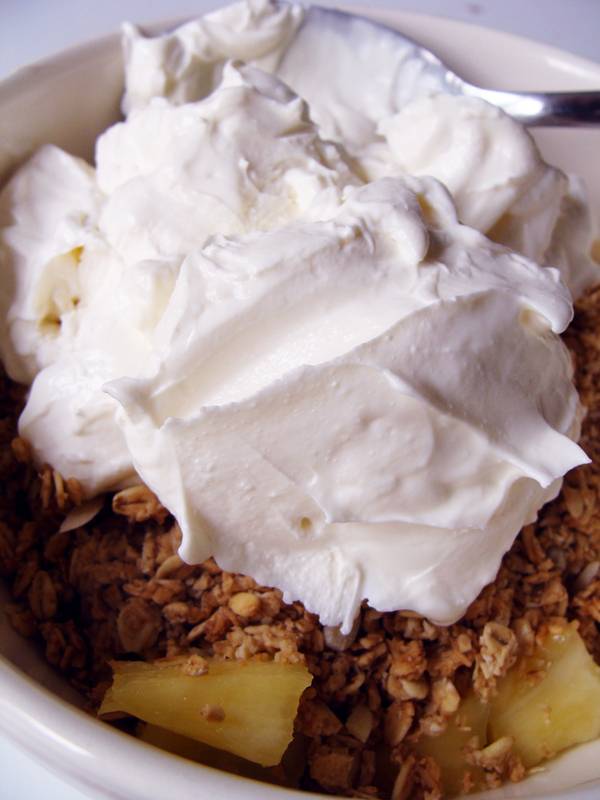 Your pineapple & granola topped with yogurt looks amazing.